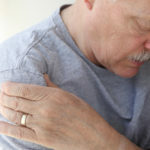 Another condition of the shoulder that results in pain is arthritis. There are many forms of shoulder arthritis. The most common two types of shoulder arthritis include: 1) osteoarthritis: the degenerative (“wear-and-tear”) arthritis that develops with age, old injuries, and long-standing overuse and 2) rotator cuff arthropathy: the wear that develops in the setting of a long-standing rotator cuff tear which causes a less stable joint or migration out of normal alignment. Other types of arthritis can be related to inflammation or infection, however, these are less common. Arthritis can lead to pain that causes people to use their shoulder or arm less. With increasing pain, individuals tend to use the shoulder less, which eventually results in stiffness and further painful restriction of the shoulder. Arthritis not a reversible problem but there are treatments to help control symptoms and relieve pain. Conservative treatment options include: activity modification, oral anti-inflammatory medications (if no contraindications), over-the-counter pain medication, injections, or gentle therapy. If symptoms worsen or are inadequately treated by conservative measures, some patients may be a candidate for a total shoulder replacement.